Things I Love About Wizzley: "Export As Text" And The "Print Facility"
What I love about Wizzley is how simple things are not made difficult. 'Export as Text' is a great facility for writers. The 'Print Facility' is great for all. Reasons to use them. 1. I don't know about you but I would be struggling, not only to write 400 words about the print function, but also to keep you interested and involved long enough to make a very important point. 2. When combined, these two little beauties are so powerful (here I am going to use a phrase that was used in a comment on one of my Wizer's) they will "blow your socks off". Have I not given you good advice previously? But first, I think it prudent to point you to each of the facilities, so you know where they are for you to utilize. 'Export as Text' is only available in 'Edit page' mode. This is as expected and as required: You don't want your hard work easily copied by others, now do you? The screenshot below shows you that it is situated at the bottom of the right hand column, just above the new VigLink link. Follow the arrow and you will find it there. My advice: use it every time you complete an article and publish. That goes for every amendment, of any significance, that you make. Why? I'll tell you later. Set up a separate directory where you can keep an archive of everything you produce. Save each text version in separate sub-directories for each article. That way you can choose a title that places the article in a logical progression of amendments. My suggestion: use the date format yyyy:mm:dd and then hh:mm if necessary, that's year:month:day hours:minutes. A lot of work? Not really, Wizzley has made it easy to do it. Just click the link and follow the method. Now, the print facility is pretty standard, but you will need to transfer to 'Page View' mode or go look at the published version of any Wizer. Once you get down to the very bottom, after reading all that lovely text, and marvelling over the beauty of the design, that a Wizzley author has created, you will find a set of icons immediately above the comments section (that is, if the comments section has not been switched off). 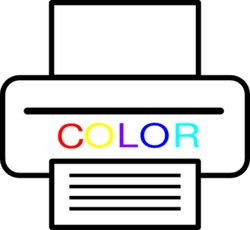 It does not matter whether you have a dot matrix, as indicated by the icon you see there, or whether you have a laser printer or a color printer, each will give you a print-out of the page. It's just that, to get the full value of the page, the better the printer, the better the visual impact. Why is 'Export as Text' Important? I don't know about experiences at alternative writing sites, other than Hubpages. There, to archive one of your masterpieces, you have to go through the whole rigmarole of copying and pasting in order to transfer the contents from the screen to an offline document. This takes time and effort that does not need to be expended. Wizzley has generously circumvented the necessity for all this wasted expenditure and given us a one-stop-shop ('Export as Text') to do that which is necessary. You never know when you are going to trash your article or sales page with amendments that just didn't work. If you are testing the efficacy of one version over another, you will want to revert, should the second or subsequent version be less effective. You never know if, or when, a site may fold (just to make it clear: I am not expecting this to happen to Wizzley. Other sites: I reserve judgement) - so it is sensible to be wise before the event and archive your content. Having an archive gives you evidence. Evidence in the event that your content is copied. Evidence that you have date-stamped. Why is Print Facility Important? I don't know about you, but, although I have a large screen to work with, and another laptop computer to work from, I never seem to have enough viewing capacity to organize my working methods, adequately. I often have to write things down in order to manage that which I am trying to achieve. That is one good reason to be able to print off sections of a document / page so that precious screen capacity is freed up. To review your offerings offline, in those moments that you have (few and far between), that can be used to pick up on spelling mistakes, over-complication, adjustments that can be made, additions that would enhance etc etc. Things that can be done by women when they are doing other, just as important things. As a secondary printed archive of your offerings. As an assist for you to add 'post-it' notes and editor's comments. And most importantly as a mechanism to prove ownership of content when that dreaded day arrives and you have to prove copyright. Proving Copyright Using These Printing Facilities. Whether we know it, go and find it, or are told that it happens, every one that writes online will at some point become aware that content that we have written has been copied elsewhere online. No matter how much we do to protect ourselves from this, it will still happen. It can have a devastating effect on our earning capacity. So what do we need to do, not to protect us from it happening, but to bring about the removal of said? There is a lot of information on the net about what to do once it has happened. In the back of my mind I have the thought that Wizzley has some mechanism by which you can send DMCA's to culprits, search engines and web hosts. But my slant is, what to do BEFORE it happens. Once it happens and you start the process to get your content removed from where it has been reproduced without your consent, you are likely to be requested to prove that it was yours in the first place. Do not expect others to go trawling through their databases to see which offering came first. Pre-empt any argument as to which came first, the chicken or the egg, and stamp the egg with a timestamp, offline from where it is delivered (at Wizzley or wherever), on your computer and in a hard-copy archive. How do you prove ownership in this way? You timestamp (and the computer confirms it) your copy when you use 'Export as Text' and place your content in a directory on your computer. You place a copy of your content, that you printed off using the 'Print Facility', having dated it by handwriting the date and time on each sheet, into an envelope. You then seal the envelope; write the date across the sealed portion; place a stamp on it; write your address on the front; and post it to yourself. When it arrives you look to see that the postmark has a visible, distinguishable, date upon the envelope. If it has not, rinse and repeat. When you receive it in the condition required, you place it, unopened, into a container with all your other copyright material, having noted the contents down somewhere, or affixed another copy to the outside. When you are asked for evidence you have all you need, to hand. If you need containers for your archive material, try here: Folders for organizing documents JoHarrington has found the perfect solution for you. 'Export as Text' and the 'Print Facility'. Make it easy on yourself: Easy archiving for all your requirements. Wizzley has a great atmosphere about it. There are no undertones of animosity. Everybody feels as though they belong. The staff are polite and helpful. What a change from Hubpages! Wizzley has great modules to create great articles. And there are useful, if little known, facilities like the misnamed 'Fan Pages Feed' s/b 'Favorite Authors Feed': I love it! Here are the members of the top 500 retail store merchants that have an affiliate program that VigLink gives you access to. Tweet statistics - what are they? The thing I love about Wizzley is that they give you the things that you never knew you wanted, until you get them! No problem @Scotties - glad to see you here! @pcunix - I think the function is aimed more at those with less capability than yourself with regard to PC functions. That includes most of us here on Wizzley. Even without module titles, it is still better than no function at all. That said, you are right on both observations. I was actually more interested in getting the point about actually having a copy to prove copyright, quickly and easily. The 'Export as Text' and 'Print Facility' details were just a lead in to the main point of the article. Thanks for dropping by, and welcome once again, we will all be the better for you being here. @Jimmie I am glad you are gaining some benefit from my 'Things I Love About Wizzley' series. And thanks for your appreciation, it is appreciated. I'll try and increase on the series, as I find new Wizzley features that are as good as the 'Export to Text' and 'Print facility' combined. Thanks for yet another article, teaching me how to use some of the lesser known features at Wizzley. Appreciated! @brenda - see some of Katiem2 Wizer's - they explain some other little gems that Wizzley has available to you to make your articles things of beauty. @Mike, I shall be writing more stuff for myself (i.e. earning Wizer's, we all must earn a living), with fewer articles for the community, as we progress in time. As and when I find little nuggets that I can add to my 'Things I love about Wizzley' series, I shall, but most things have been covered by others. But you know Wizzley, they are bound to come up with other facilities that we can use. In the meantime I shall use my spare time to add new merchants to the lists on my VigLink Wizer. Thank you. I am overwhelmed by all the buttons and you are clearing things up for me. Chaz your helpful insights on the tools here at Wizzley make it a great place to write, and learn new tips and tricks. Thanks humagaia can't wait until your next installment. @Jeanie Welcome to Wizzley, I hope you have a long and fruitful relationship. Glad to be of service, and thank you for stopping by and commenting. It is appreciated. I am new to Wizzley and this is very useful information. Thank you for sharing!